Technology is changing and people are getting more geeky with all the gadgets and developed things in their household and their vicinity. And with the increasing tech topics in the world, the online world is always ready to update with the latest trends. Everything from Gadgets, travel, web related stuff, automobiles etc. are going in a high rise lately and everyone can not be just full of updates always unless you are subscribed to some news like sources on the web. Yes, you can have the newspapers for that, but anything can change in a minute and that’s what the web helps for, quick updates! And before you try to buy a product like a mobile phone, you would think a thousand times, or read about it on the web! The reviews that tech geeks write on the web are the one’s which help you in deciding whether the product is worth buying or not. And Amit Bhawani, a tech blogger is one of those who can help you in this regard. He writes about Mobile phones, Laptops, PC’s, other electronic gadgets including Apple products, Automobile news and reviews, career and health tips. All kind of tips and tricks related to computer and laptop security, tweaking things in your gadgets. Reviews of all kind of gadgets like Nokia N78 GPS review, Samsung i8510 review and lot more things like how to increase battery life of laptops, what all things laptop can help you do. Other sections that are included here are blogging tips, top lists, affiliate programs, and other guides. 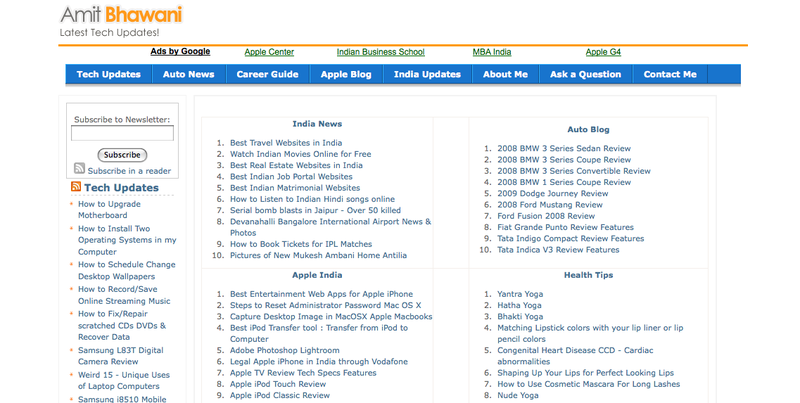 Next one is Apple India Blog – One of the very less Apple blogs for India. Apple iPhone is on the news everywhere, both online and offline. Finding more information about web applications, its review or want to know how to unlock it, that would all be good for you if you own the iPhone or are planning to buy it. And other handy gadgets like iPod etc. are always on people’s mind. Why not read something about each of them before thinking to buy it. Auto news and reviews blog is another part of the network. Here you would find reviews(mostly) of the latest bikes, cars and other automotive information. Cars of various models and companies, electronic bikes, all are reviewed. Some of which might interest you are like 2009 Dodge Journey Review, ford mustang review and for Indians, cars like Tata Indica etc. A career tips and guide blog which gives you tips on how to decide your future by suggesting the best education points, and information on various degrees and which can be the best for your future. The best schools at a particular place for a particular degree. Tips on how to get a job in Multi-national companies, and how to select the best schools and universities are given. And finally, the India blog, made for Indians. Here you would find resources mainly for Indians. For people who try to find more resources related to India on the web, this is one of those where you should land up. State information, websites for information about travel, various websites related to real estate, matrimonial etc. are all listed here. You will find this as a great resource for those who are also looking to travel to India from somewhere in the world. So those were the main sections which you would find useful in the blog. Surely worth subscribing and checking it out. Definitely a great blog which achieved lot of success in a very less time. I am a very regular visitor of that blog.. I have learnt so many things there ..